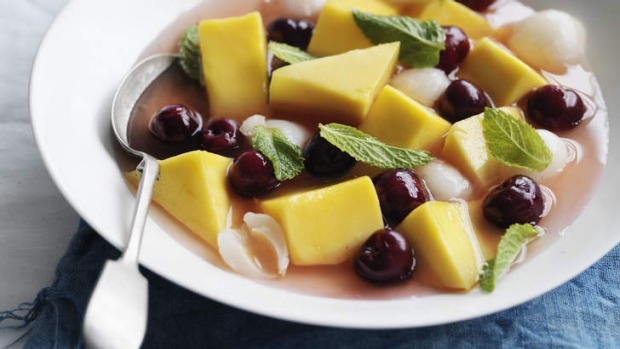 What better way to finish a meal in summer than with a big bowl of seasonal fruit? By all means, serve it with a big scoop of vanilla ice-cream, if it takes your fancy. To make the syrup, combine the sugar and 185ml water in a small, heavy-based saucepan and stir over a low heat until the sugar is fully dissolved. Add the lime zest, lime juice and lemongrass, bring to the boil, reduce the heat and simmer uncovered for 8 minutes. Strain. Combine all the fruit in a large bowl. Toss with the syrup and place in the fridge for a couple of hours. Gently toss through the mint leaves and serve immediately.